This is an old revision of this page, as edited by Wardynska (talk | contribs) at 18:16, 14 September 2009. The present address (URL) is a permanent link to this revision, which may differ significantly from the current revision. The capture of the city by the Crusaders. For other sieges of Constantinople, see Sieges of Constantinople. The Siege of Constantinople (1204) destroyed parts of the capital of the Byzantine Empire as it was captured by Crusaders. After the capture the Latin Empire was founded and Baldwin of Flanders was crowned Emperor Baldwin I of Constantinople in the Hagia Sophia. On 12 April 1204 the weather conditions finally favoured the Crusaders. A strong northern wind aided the Venetian ships to come close to the wall. After a short battle, approximately seventy crusaders managed to enter the city. Some Crusaders were eventually able to knock holes in the walls, small enough for a few knights at a time to crawl through; the Venetians were also successful at scaling the walls from the sea, though there was extremely bloody fighting with the Varangians. The crusaders captured the Blachernae section of the city in the northwest and used it as a base to attack the rest of the city, but while attempting to defend themselves with a wall of fire, they ended up burning down even more of the city. This second fire left 15,000 people homeless. The Crusaders took the city on April 12. The crusaders inflicted a horrible and savage sacking on Constantinople for three days, during which many ancient and medieval Roman and Greek works were either stolen or destroyed. The magnificent Library of Constantinople was destroyed. Despite their oaths and the threat of excommunication, the Crusaders ruthlessly and systematically violated the city's holy sanctuaries, destroying, defiling, or stealing all they could lay hands on; nothing was spared. It was said that the total amount looted from Constantinople was about 900,000 silver marks. The Venetians received 150,000 silver marks that was their due, while the Crusaders received 50,000 silver marks. A further 100,000 silver marks were divided evenly up between the Crusaders and Venetians. The remaining 500,000 silver marks were secretly kept back by many Crusader knights. Latin residents of Constantinople, meanwhile, took revenge for the Massacre of the Latins of 1182. According to a prearranged treaty, the empire was apportioned between Venice and the crusade's leaders, and the Latin Empire of Constantinople was established. Boniface was not elected as the new emperor, although the citizens seemed to consider him as such; the Venetians thought he had too many connections with the former empire because of his brother, Renier of Montferrat, who had been married to Maria Comnena, empress in the 1170s and 80s. Instead they placed Baldwin of Flanders on the throne. He was crowned Emperor in the Hagia Sophia as Baldwin I of Constantinople. 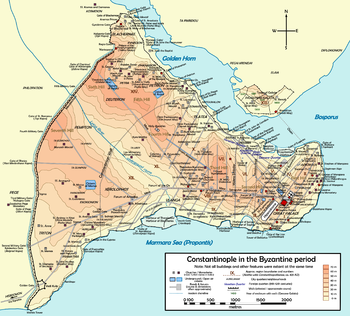 Boniface went on to found the Kingdom of Thessalonica, a vassal state of the new Latin Empire. The Venetians also founded the Duchy of the Archipelago in the Aegean Sea. Meanwhile, Byzantine refugees founded their own successor states, the most notable of these being the Empire of Nicaea under Theodore Lascaris (a relative of Alexius III), the Empire of Trebizond, and the Despotate of Epirus. Eight hundred years after the Fourth Crusade, Pope John Paul II twice expressed sorrow for the events of the Fourth Crusade. In 2001, he wrote to Christodoulos, Archbishop of Athens, saying, "It is tragic that the assailants, who set out to secure free access for Christians to the Holy Land, turned against their brothers in the faith. The fact that they were Latin Christians fills Catholics with deep regret." In 2004, while Bartholomew I, Patriarch of Constantinople, was visiting the Vatican, John Paul II asked, "How can we not share, at a distance of eight centuries, the pain and disgust." This has been regarded as an apology to the Greek Orthodox Church for the terrible slaughter perpetrated by the warriors of the Fourth Crusade. ^ "Sack of Constantinople, 1204". Agiasofia.com. Retrieved 2008-12-30. ^ "Preface". Clir.org. Retrieved 2008-12-30. ^ "The Latin Occupation in the Greek Lands". Fhw.gr. Retrieved 2008-12-29. ^ "In the Footsteps of St. Paul: Papal Visit to Greece, Syria & Malta - Words". Ewtn.com. Retrieved 2009-05-18. ^ "Pope Expresses "Sorrow" Over Sacking of Constantinople". Atheism.about.com. 2004-06-30. Retrieved 2009-05-18. ^ Phillips, The Fourth Crusade and the Sack of Constantinople, intro., xiii). ^ "In Pascha messages, Patriarchs address question of violence". Incommunion.org. Retrieved 2009-05-18.